MUST-PLAY is a series focused on titles you may not have heard of, recently or from yesteryear. The thing is, this title requires a playthrough. If for anything, the experience alone will impact you in a massive way. I’m focusing on a single game that is on Steam, that I’ve played and found to be so awesome that you MUST play it. There’s no question, you have to. Mhm. Good so you have it in your cart already? Great. Now install and play. Thank me later! Brothers: A Tale Of Two Sons is an example of phenomenal game design, and incredible story direction. I’ll explain. The premise is fairly simple: You play as two brothers on a journey across various environments to help your family. Thing is, the story is told entirely without spoken (actual speech) dialogue. Everything story-wise is handled as gibberish, the same way The Sims does. The fact that Brothers: A Tale Of Two Sons has such a heartfelt, exceptionally impactful and touching story without saying a damn word of english (or any language for that matter) makes it such a masterpiece. Since the ‘writing’ and story are so amazing, what’s a story if it has crap gameplay? Brothers: A Tale Of Two Sons is a poster-boy (brother?) for highly polished and tuned gameplay. The core gameplay loop surrounding two characters (played by one person) working together to solve problems and puzzles as they continue their journey is always intrinsically rewarding. The more you make the brothers work together, the more you get to ‘know’ them. The most unique thing about Brothers: A Tale Of Two Sons is the way you handle the controls for both. Right trigger and right stick are for one brother, and the left for the other. It takes some getting used to, but the way they psychologically have you left-right brain-handling the characters is so conducive to how the game makes you feel. It’s brilliant in its design and its philosophy. I highly recommend it, check it out on Steam. 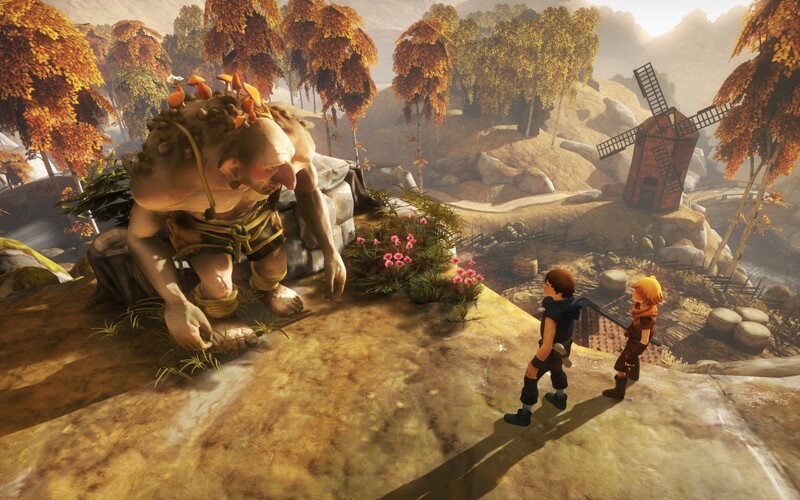 Have you geeks played Brothers: A Tale Of Two Sons yet? Let us know in the comments!